Welcome to Sanshirokwai Aikido Club. 01 Sanshirokwai Aikido Welcome to Sanshirokwai Aikido Club. Croeso, a warm welcome to Sanshirokwai Aikido Club. 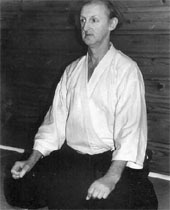 Our club was Founded by Sensei Steadman Davies MBE who passed away in August 2010. The Instructors at Sanshirokwai have all been pupils of Steadman`s for many years and have gleamed a high degree of Sensei`s knowledge to pass on to future Aikidoka`s(Aikido practitioners). Under the guidance of Sensei John Jenkins the Aikido classes are held during various time of the week to suit all requirements. Please feel free to come and join us as all abilities are welcome. AIKIDO, developed by Morihei Ueshiba(right), is a method of self-defence which can be used against any form of attack. At its highest levels of discipline and coordination Aikido becomes a "way" of harmonizing all of man's vital powers. 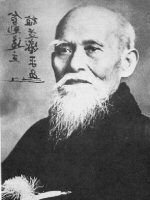 There is no attack in Aikido, its goal is merely to neutralize an aggression and render the attacker harmless, without causing him any serious injury if at all possible. The very word Aikido contains the three elements which comprise the art: AI, harmony or coordination, KI, spirit or energy, DO, the method, the way.